Twitter is my favorite social network platform, as I explained in a previous post. Mostly because it d0esn’t require to register with a real name, doesn’t stress you all the time to put a picture or personal info, and much more. So it seems much less intrusive as Facebook, for example. 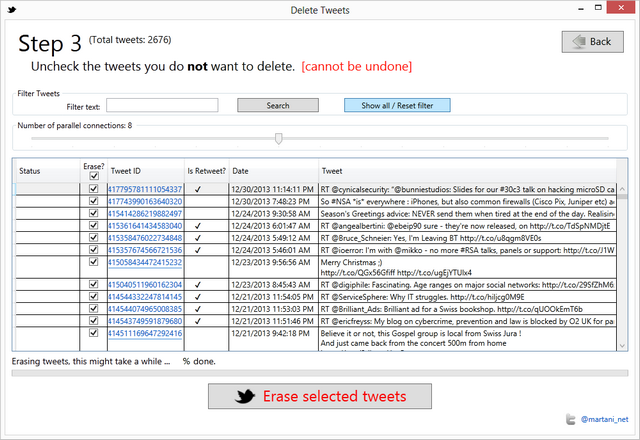 And amongst the real benefits from Twitter, it’s also possible to retrieve an *usable* archive of all your previous tweets. The procedure is really simple and consists of clicking a « make archive » button in Twitter settings, then wait for the email when it’s ready and click on the download link. I did appreciate this. But the really great thing is that the archive itself is really good : you’ve got all your Tweets in CSV format with lots of details, and also a full HTML browsable archive containing all pictures and more. So thanks Twitter !! So I’ve deleted all my tweets… but there’s a glitch : according to Twitter, I now have « no tweets » but the counter displays 28 tweets ! (and by the way, I’ve put the archive on my website, so it’s still browsable/searchable, but at least I have more control on it than on a 3rd party site). So, how did you do to change that ? 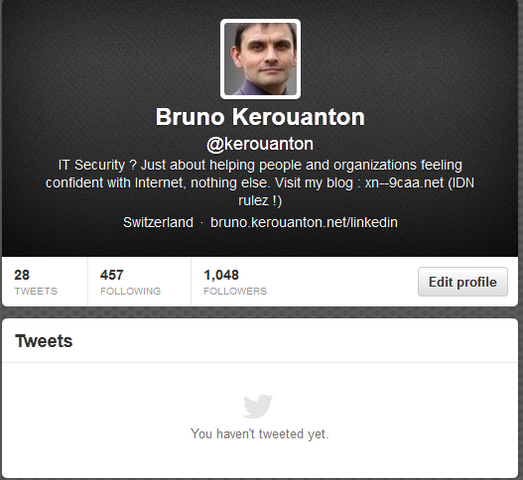 I mean … it shows 28 tweets even if there is no tweet anymore. I have the same problem actually. And the most intriguing part is that I have the same issue for the people I follow. For some reason my account unfollowed everybody but at the end it still counted more than 15 accounts that I was supposed to follow, but that didn’t display as a list. That is weird, I cannot decide if it’s because Twitter silently inserts invisible followers and tweets for some reasons, or if because there is a bug somewhere. Anyway, that behaviour seems to be quite common according to most people who tried to delete all their tweets. Do you want to investigate on this ? I have the same problem now. I deleted all my tweets but the number’s still there. How have you solved this ? Hello! It has been a little less than 4 months, so I was wondering if you already solved your problem, because I’m going through the same situation at the moment and it would mean a lot if you could help me, since nobody could yet. Merci beaucoup!